We are UJUDEBUG and we love what we do. Hello people, as UJUDEBUG extends its heartiest greetings, a window of opportunities opens for every one of you right here, right now. Starting this year, Ujudebug, a Guwahati and Tezpur based software company, is providing a vast platform of opportunities to all interested to sell it's products to potential customers, B2B or B2C. The reason being the emphatic completion of a glorious year by the Company amidst the love and response of all you people. On the first year of inception Ujudebug was more concentrated on its growth and development as one of Assam’s premiere technology company and so our business was primarily associated with a closed group and our sales were basically conducted by personal agents. But UJUDEBUG has always been a company of the people and for the people. So, with the experience of a glorious year of numerous achievements under its belt, UJUDEBUG has decided to make itself more available to people by being completely among the public. So, as a wonderful news for all people out there, we are looking forward to expand our business with the help of some dynamic representatives. Any person interested in sales activities and marketing of products can just contact UJUDEBUG through the below mentioned sources. People who are searching for such an opportunity are requested to submit their ID and address proof along with a minimal registration fee. The representatives willing to work are expected to go through some agreement as per company's norms. Moreover each representative will have professional freedom of engaging anybody to sell company's goods, on which the registered representatives will get their commission. 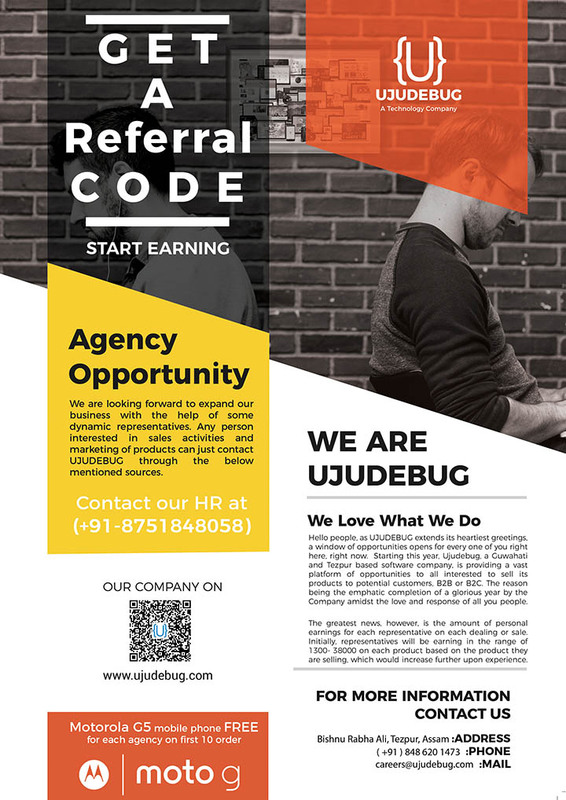 So, without wasting further time, interested persons are asked to contact our HR at (+91-8751848058) or they can drop a mail at (careers@ujudebug.com). Looking for agency opportunities with UJUDEBUG? We invite you to apply for agency opportunities at UJUDEBUG and be a part of a wonderful family which accepts you just the way you are. ID Proof must be in PDF, DOC, DOCX formats. The maximum file size is 5 MB. Address Proof must be in PDF, DOC, DOCX formats. The maximum file size is 5 MB.